LittleRedFishermsn and I were trying to plan a river adventure, but overnight rains on 1/23 made our rivers rise a bunch so we shifted our sights to the White River. They’ve been running a bunch of water and we were gonna sling jerkbaits and look for a BIG bite. Well...best laid plans and all ... Bret couldn’t get over here ; house stuff required his presence. So, I shifted my sights again to the Norfork. I didn’t get a Brookie last year and I had hopes for a Slam. I must be getting soft in my old age. It was pretty chilly getting the boat hooked up and gear loaded. I decided to let it get above 20 before I headed to the river. 22 when I left the house and 27 when I launched the boat. Surprisingly, I was the only boat at the ramp. I tried the pool above the ramp. I think there were Shad coming through because gulls were working hard, but our govt protecting us from ourselves won’t let you fish anywhere near where that is happening. In all fairness, ppl would die, but the fishing would be GREAT! Anywho...got bites, caught nothing. They were running two units FULL which makes fishing harder and boat control a nerve wrecking exercise. I caught fish and I didn’t die. I would have caught more fish and been at much less risk on 1 unit. Just saying. Richard Cross will be Happy to hear I lost a bunch of jigs. I managed to avoid losing any jerkbaits. With 2 ppl, you might get 1/2 of the hang ups loose. After I almost broke a rod, I quit trying to get my jigs back. I caught a handful of fish on a jerkbait. No Browns on it. I lost a couple of fish so who knows. Long Hole treated me a little nicer, but was much more difficult boating. McCllelands is an awesome spot. Awesome. Better with less water , but awesome. I caught fish down btw McCllends and second island as well as btw the Two Islands. I had caught some beautiful Cutthroat in the catch and release area and a Fat hen German Brown Trout just above the second island so I wanted to complete the slam. 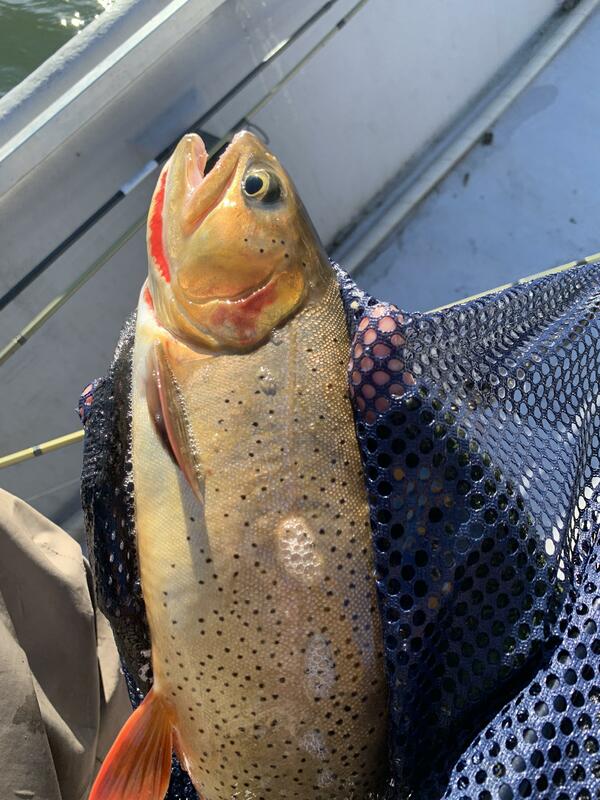 I ran back up and fished Long hole a few drifts, I gave the big pool by Gene’s a few drifts, and I went back to the upper lagoon and tried the mouth of Dry Run where I caught more Rainbows but no Brook trout. By this point, I was tired and cold. I had caught 27 fish and decided to pull the plug on the day. I was exhausted from the wind and cold and stress. I had a nice supper and went to bed super early.